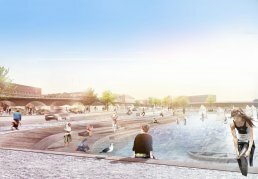 Struer has created a multifunctional climate project that combines flood protection and a new urban recreational space to reconnect city and harbor. Due to its location, Struer is vulnerable to floods from both the sea and cloudburst events. With the new flood protection installed, the municipality is not only able to control potential floodwater, but is also renewing the urban landscape. The project consists of strategically placed curbs and moveable components to defend the land against floodwater. The flood protection system is integrated into the harbor area to withstand rising sea levels from the Limfjord, creating a new social urban space at the waterfront. Existing arch bridges, placed on the central part of the harbor, retain the water and allow downward flows from cloudbursts while preventing tidal waters rising from below. Struer's location at the Limfjord implies a natural storm surge risk, which is expected to increase in the coming years. The installation addresses three challenges. First and foremost, it protects the city from storm surges and cloudburst events. In addition, it reconnects the city and the harbor in a new, open and inclusive urban space with room for small shops and cafes. Finally, the new architecture reduces heavy traffic through the area and provides better space for pedestrians and cyclists. Overall, the project illustrates that socially conscious urban planning and climate change adaptation can go hand-in-hand. By reconnecting the city and the harbor of Struer, space is created for new shops and cafes, generating new commercial opportunities throughout the area. Struer Municipality shows how climate-proofing can be combined with a social goal of creating better urban spaces for the benefit of the city's operation, businesses and citizens. The project will prevent increasingly occurring storm surges from devastating the harbor area in Struer, while also draining surface water during extreme rain events. 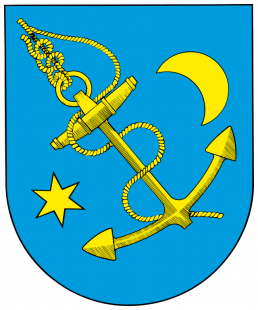 Struer Municipality is a municipality in Mid Jutland Region on the Jutland Peninsula in west Denmark.